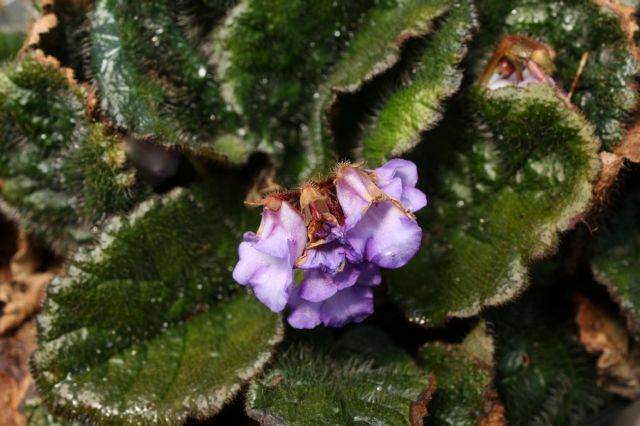 We are welcoming comments on these new Gesneriads. The morning is sunny and I leave my house at 7am for one of the U.K. premier nurseries, Crûg Farm in Wales. 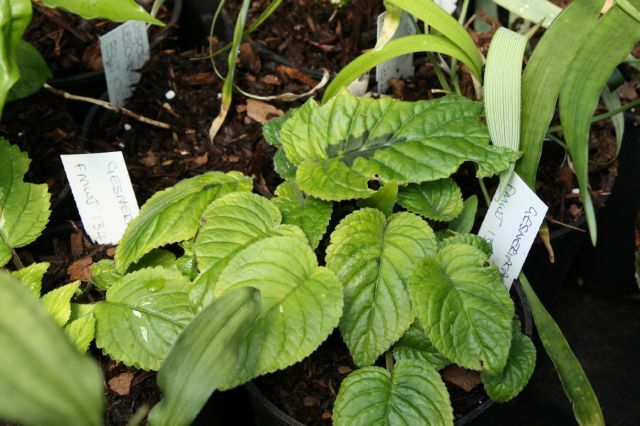 It is Crûg Farm’s heritage day and plant fair with smaller nurseries travelling from around the country to sell their personally grown plants of various genus. I have a very small list of plants in my wants book, Conandron ramondioides BSWJ8929, Oreocharis aurea BSWJ11718 and Briggsia kurzii GWJ9342. The Briggsia I have grown before and lost through excessively, either too dry or too wet. I remember growing the Briggsia (generally a difficult and demanding plant) successfully during the summer and then, approaching the autumn, I kept the soil dry and continued this throughout the winter. As the spring warmed up I gave the pot a good drink, so you see, either too dry or too wet because three weeks ago there was not a stitch in the pot. Crûg Farm is set in a stunning location and the gardens have now matured and it makes sense to walk slowly and examine every plant planted. 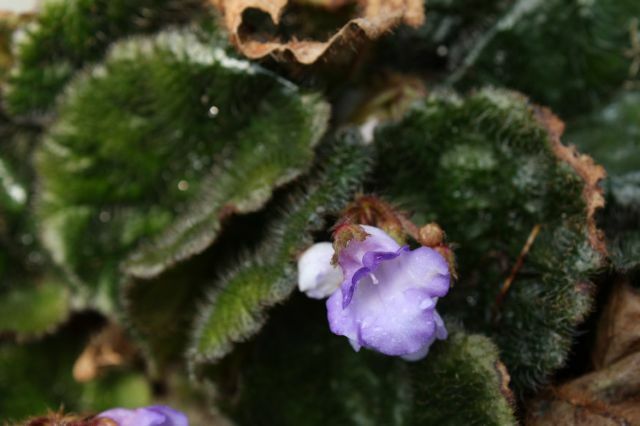 After wandering around the gardens and the nurseries Bleddyn was itching to show me a special gesneriad which had flowered over the last two weeks. Bleddyn led the way and I marched rapidly behind him, ducking under rope and skipping over the signs warning “private” ” no admittance” we headed off towards a small closed polythene tunnel. 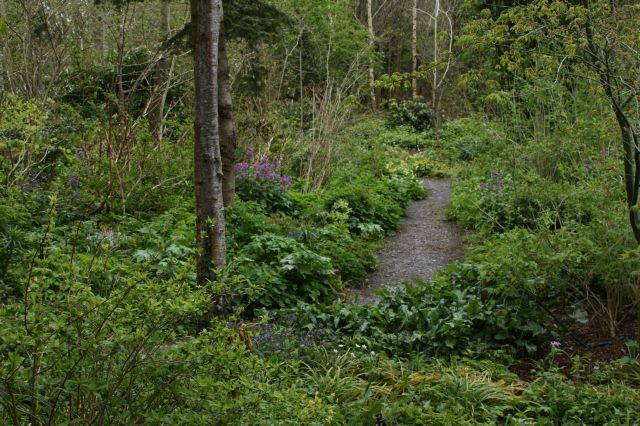 Bleddyn opened the door and the humidity hit the back of my throat, my glasses steamed up and I turned my head to the cool outside to grab a last gasp of air before heading towards the new collected plant gems. New plants were stacked on benches three tiers high and some we showing off their fantastic new flowers. 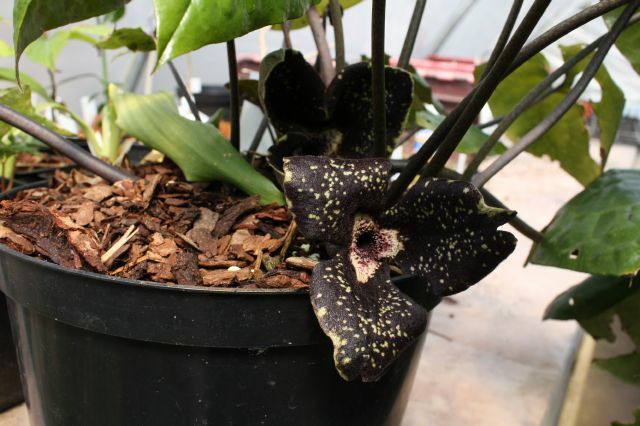 The first stunning plant was a new Asarum sp, below. 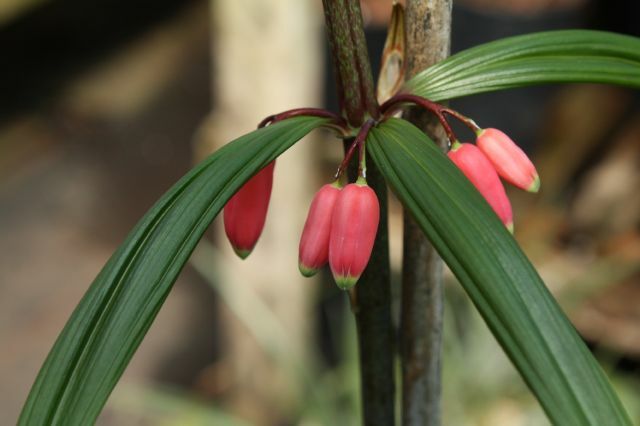 Then a six foot high Red Polygonatum kingianum with stunning flowers, below. Bleddyn reached down and lifted up to show me a large pot with six pale light and dark blue with a pale blush blue, white Gesneriad flowers. Bleddyn was understandably shy with too many details, but was allowing me to take a few pictures and gave me permission to blog the pictures on the internet, Thank you Bleddyn. 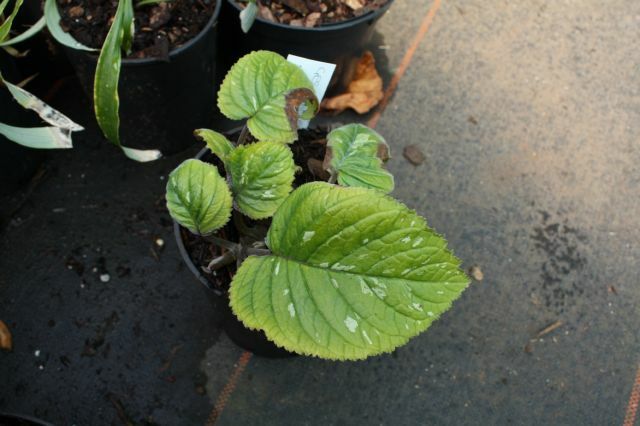 There were a number of fabulous new plants but I was specifically asking for Gesneriads, so Bleddyn leaned under a very full wooden bench and pulled out two more gems, not showing any flowers as yet but the leaf markings were interesting. So I came home with photographs and was in total exaltation for Bleddyn and Sues work collecting new plants for us the general gardeners. Crûg Farm is truely the best UK nursery for new and excitingly rare plants. Bleddyn and Sue has travelled the world to bring home new plants, it is amazing to think we only have to travel a short distance in this country to acquire a new plant for our garden.